The 2018 wildfire season in California has been one of the most destructive on record. 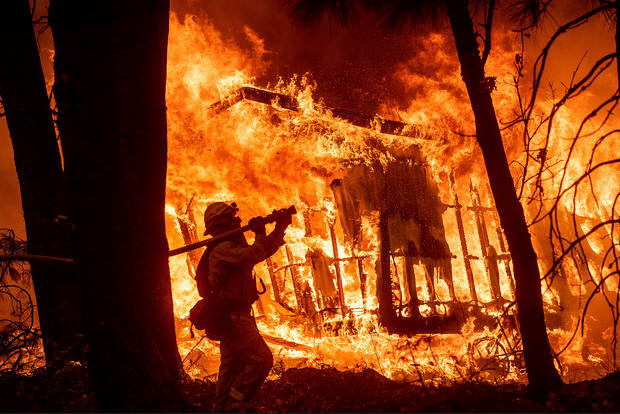 During 2018, a total of 7,579 fires had burned an area of 1,667,855 acres (6,749.57 km2), the largest amount of burned acreage recorded in a California fire season, according to the California Department of Forestry and Fire Protection and the National Interagency Fire Center, as of November 11th. As reported by CBS news, this is also the wildfire with the highest number of casualties in California history. 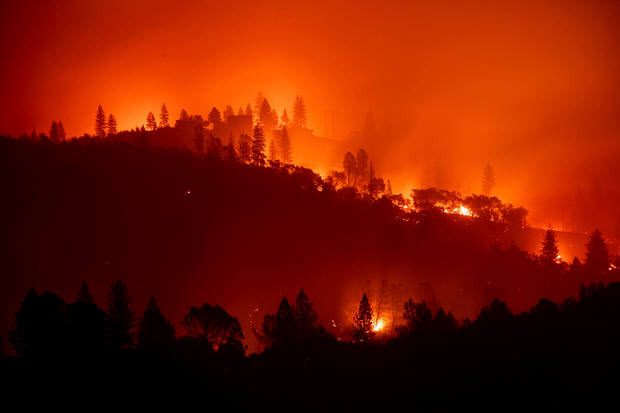 The "Camp Fire" has now been blamed for 48 deaths as of Tuesday night. Remains of six humans were found earlier in the day. Two other deaths in the state bring the total to 50 killed. There are some 5,615 personnel fighting the blaze. Some 52,000 people have been evacuated. A total of 8,817 structures have been destroyed. Of those, 7,600 are homes. The "Camp Fire" has been 35 percent contained, as of Tuesday evening. A total of 130,000 acres have been burned so far. According to RT.com, there is also a question of possible spread of toxic and radioactive substances from a Superfund site, according to activists who believe authorities might be downplaying the risks. The fire passed through the Santa Susana Field Lab (SSFL), a federal Superfund site in the Simi Hills that was the site of the worst nuclear meltdown in US history in 1959. While the California Department of Toxic Substances Control said there was no reason to be concerned of "any risks other than those normally present in a wildfire situation," locals aren't so sure, pointing out that the agency has dragged its feet in cleaning up toxic sites and accusing it of a possible cover-up. Physicians for Social Responsibility Los Angeles president Robert Dodge castigated the DTSC, pointing out that the site – now owned by Boeing – remains radioactive and polluted despite the agency's promise to clean it up eight years ago. "These toxic materials are in SSFL's soil and vegetation, and when it burns and becomes airborne in smoke and ash, there is real possibility of heightened exposure for area residents." 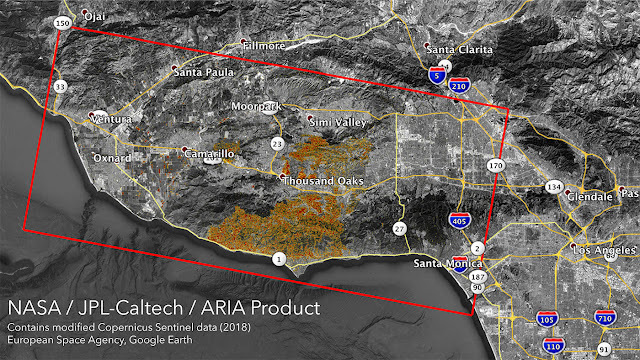 As mentioned in the previous post, there are evidence that this wildfire was set off by the Cabal, potentially involved the use of directed energy weapon. Hence, due to the nature and severity of this wildfire, we suggest a daily Buddhic Column meditation at 4 PM UTC to dissipate the Californian wildfires from now on, until they are fully contained and put out. If you feel guided, you may also keep including this in Emergency Meditation daily at 2 PM UTC, as was requested in our previous post. 3. Visualize a 5-pointed star being place high in the sky about 9 miles above the areas of wildfire at California. See this star glistening high above the chosen location, shining brilliant white light. 4. Now visualize the White Fire of AN emanating from the Galactic Central Sun, going through all points of light within our solar system and through the 5-pointed star, through the areas of wildfire at California and deep into the center of the earth. Keep visualizing this pillar for a few minutes. 7. Now, in the name of Source, in the name of I AM Presence of eternal light. We declare and command that the Buddhic Column at the areas of wildfire at California is now complete on all planes as guided by Source. You may use the image below to help visualizing a Buddhic Column above California. « Il existe encore une troisième réponse. Les composantes pratiques de l'IDT sont la méditation non religieuse et les programmes plus avancés. Un puissant effet de cohérence et de paix se produit sur le terrain et se répercute sur la population environnante. De grands groupes d’experts IDT atténuent le stress collectif. Créer la prospérité, la croissance économique et la paix pour tous. Cette réponse serait de faire connaître un moyen peu connu de mettre fin à la guerre et au terrorisme une fois pour toutes: Invincible Defense Technology (IDT) . Il existe une solution scientifique et militaire testée sur le terrain qui découle des dernières découvertes dans les théories de la physique, des neurosciences et des sciences sociales du champ unifié - non pas d'approches utilisant des armes, ni du domaine de la politique. Des études ont également montré une réduction des hostilités, des actes d'hostilité, un nombre accru d'événements de coopération, la réduction des accidents, des hospitalisations et de la mortalité infantile. En raison de cette recherche, l’organisation à but non lucratif Global Union of Scientists for Peace (GUSP) préconise cette approche simple et économique pour réduire le stress social (voir: https://www.gusp.org/global-peace-summit). Des résumés de cette recherche sont disponibles à l’adresse suivante: https://davidleffler.com/2011/sapratableii). En raison de ces changements positifs, les armées d'Amérique du Sud et d'Afrique testent maintenant activement cette approche sur le terrain.